& the house on Venice Beach shook to the timbers. It didn’t feel like an earthquake, but that can never be discounted in SoCal. I was convinced it was an explosion. Nothing was broken, just a few paintings were askew. No sirens, helicopters or electrical outages. Life went on as usual outside. It turned out we were at the EPICENTER of a quake that hit in the ocean, just one-mile off the Venice Pier. Amazingly, it was tiny, just 3.4 on the Richter scale. I’ve experienced countless tremors & many earthquakes; a hurricane in Fla.; a cylone, going down the other side of a fairway on a golf course in Ohio; & a typhoon in China!–But this one spooked me. China’s opening ceremonies were spectacular!!! I thought it impossible to outdo the magnificent show put on in Athens–but w/ unlimited money & great ability the Chinese did it. Director Zhang Yimou: What a job!!! Might and the collective spirit were emphasized. There were no individual performances. The sheer manpower & creativity was breathtaking–& scary. Now, 1.3 billion strong w/ the world’s 3rd largest economy—like the roots of this country, it’s built on slave labor. 1.) The govt. keeps things shut tight. I saw a dozen drug dealers shot by a firing squad on the news there. I’m shocked someone stabbed the American tourists. It doesn’t surprise me that the perp took his own life afterward. 2.) I saw a brochure for a golf course in the wealthy Shenzhen industrial zone, directly across the harbor from Hong Kong. You often see HK businessmen taking their clubs on the ferry to the mainland for a round. The club’s clientele must have been having trouble w/ the difficult game: the brochure told perspective members that in golf a high score is the best score!!! The 1st events I saw were swimming. The US girl swimmers were camera-ready:wearing waterproof makeup & stud earrings! 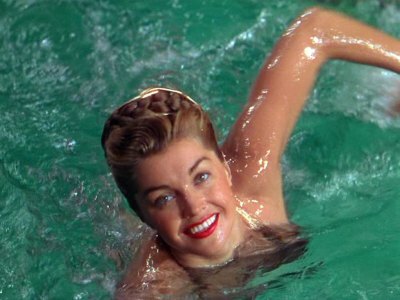 It seemed so strange & artificial, like Esther Williams at MGM!!! Huge carbon clouds, blk & dirty, are floating all over the world. They’re from the industrial mess in China. During the mid-90s I spent time there, in my incarnation as fashion designer. They put their best faces on when doing business. Constantly In the company of young English-speaking translators & execs–smart, funny, curious– during downtime I would be taken to non-stop 10-course meals at exotic restaurants. Working in an industrial zone, on a few occasions I saw the mess hidden behind the factories. The Chinese are ravenous–they can’t get enuff of Western lifestyle!!! Economic growth has been the ticket out of poverty and isolation. The pollution caused by China is a FAR GREATER PROBLEM than imagined. It will come home to roost. A free Tibet & pollution safeguards will not happen!!! & THE CO-DEPENDENT RELATIONSHIP W/ THE US WILL NOT STOP!!! Moving on to LA. The million trees Mayor Villaraigosa proposes for LA are not the iconic palm (HIS PEOPLE said nix) but dirty, disease-prone sycamores. I’ve lived w/ both. Palms are it! Someone w/ an “in” & a million sycamores probably got a sweet city contract??? No??? A nod to giants: Clorox bought Bert’s Bees & opened GreenWorks, a new mass-market environmentally friendly product line; Google is bankrolling renewable energy R&D.